Mosquito season is almost here. I've got your back with these amazing tips and tricks to keep your summer mosquito free. Mosquito Repelling Plants: Plant in large pots around your front porch or other outdoor gathering areas. Plant next to any door s or open windows to keep mosquitoes from entering your home. 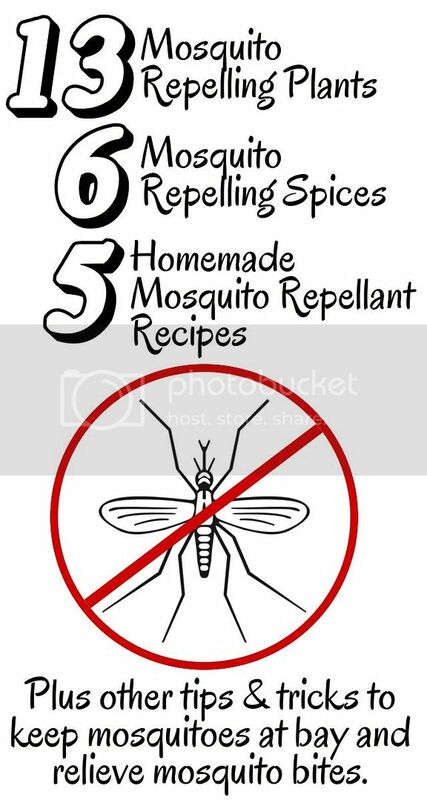 Mosquito Repelling Spices: Sprinkle across doorways and window sills. Mix up a few of your favorites and keep in an open container on your patio. Homemade Mosquito Repellants: Combine any of the following recipes in a spray bottle and mix well. Spray on yourself and around you. Keep a Bounce dryer sheet in your back pocket. Spread Vicks Vapor Rub on your chest. Make a bat house. Bats love mosquitoes so if you don't mind having them around they may become your best friend during mosquito season. Rub a bar of dry soap over the bite. Dab some lemon juice or toothpaste on to the bite. Rub a banana on your bite. You read my mind! I was getting ready to look for repellant plants!!! Mosquitoes love me in the worst possible way. Can't wait to raise my own bats just so I can fight off mosquitos. Said no one ever. Thanks for these tipps and tricks, but when its too late and the mosquito already bit you, the best way to treat is: heat a spon in hot water and press the hot spoon on the bite(attention: do not burn yourself!). The heat will disintegrate the proteins of the poison. It will stopp itching and will be gone the next day. Neem is one of the BEST mosquito repelling plants there is! The tree itself lives a long and healthy life in the right climate, free of damaging pests because of its natural ability to repel insects. Add Neem Oil to any DIY repellant along with any of the mentioned oils and you will be safe for hours. Also cedar is a wonderful repelling oil. Bat houses are near useless and rarely occupied by bats (who's diet has been proven to consist of far less mosquitoes than originally thought). I've had success with natural granules combined with a mosquito trap device that emits co2 and other attractants using propane. I think that bat house do work, it all depends where you are and if there are any bats there.